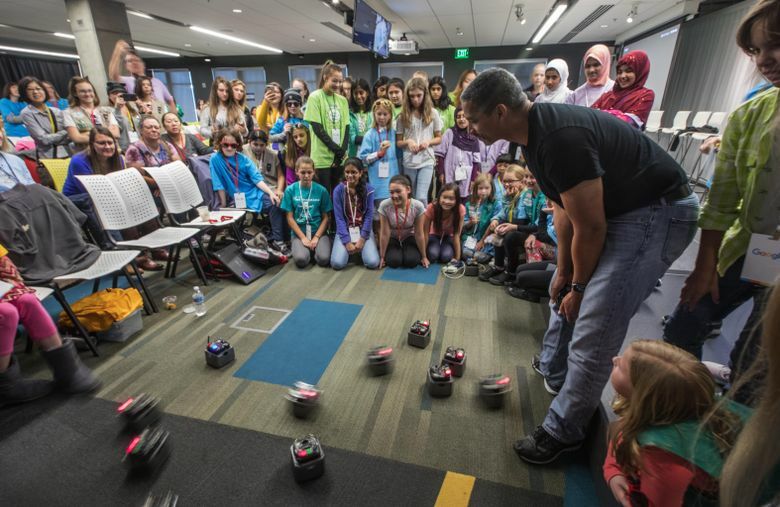 A group of 80 Girl Scouts took their robotics skills to Google’s Fremont campus. "These are my people," one Google engineer remarked. The company is giving the Girl Scouts $50,000 to fund more STEM programs. It all came together for Angela Templin when she couldn’t stop taking things apart. Old telephones. Clocks. That led to shop classes where she was the only girl, and a career as a mechanical engineer where she’s still in the minority. It’s not going to be that way for her daughter, Ashlyn, who was one of 80 Girl Scouts invited to Google’s Fremont campus the other day to show off their robotics skills, connect with female engineers and programmers, and get a tour of the place. 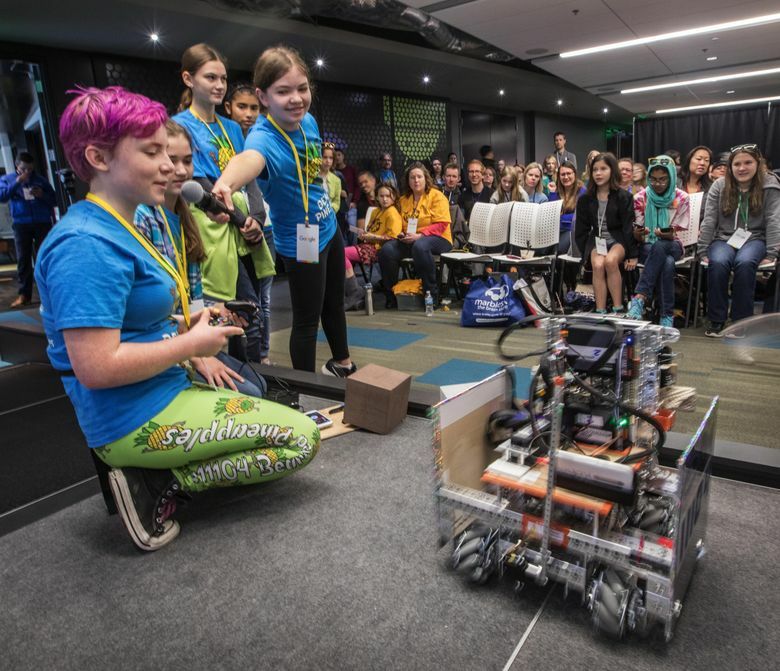 Google used the event to announce a $50,000 grant that will help the Girl Scouts of Western Washington create and support robotics teams in South King County, as well as Skagit and Cowlitz counties. The grant answers a clear need: Research shows that 80 percent of all students completing AP Computer Science classes are male. In 2014, 62 percent of all students completing undergraduate STEM (science, technology, engineering and math) degrees in Washington were male. Darcy Nothnagle, the head of external affairs for the Western Region at Google, said that by the year 2020, there will be a million jobs in the tech field. At least 80 potential future employees were in the room as teams of fifth-to-ninth-graders with names like Mermaid Cats, Wonder Bots, Electric Squirrels, Green Jelly Beans, Water Dragons, Howlers and Not So Mad Scientists showed how they had built and programmed their robots to move and stack foam cubes. One team attached their phones with holders they made using a 3D printer. “People don’t realize how hard it is to move a cube,” said Tallula Amsbry, 15, who attends Tesla STEM High School in the Lake Washington School District and is a member of a team called The Bearded Pineapples. Amelia Eckardt, 11, said her team — The Water Dragons — had an easy time dividing duties. Eckardt likes “solving problems that contain numbers” and hopes to become a computer scientist. When he got into robotics at age 12, there wasn’t a girl to be found. James McLurkin, a senior hardware engineer at Google, told the group about building robots as a kid, showed how they work at companies like Amazon, and brought a battalion of swarm robots that took over the front of the room. McLurkin thinks that in order for engineering to work, it has to have all kinds of minds behind it. Templin said her daughter was definitely in her element. “Ashlyn wants to be a veterinaut,” Templin said.